the fifth chapter of Christian Fierens’ The Psychoanalytic Discourse. husband and wife, family, teacher and pupil, analyst and analyser – hopeless. formation.’ Work, that we in ISLP at the very least, surely mustn’t shirk. What of the analyst in the group setting who might want to assume a role? named in a classical group’. Is the lot of the analyst then solitude or solidarity? 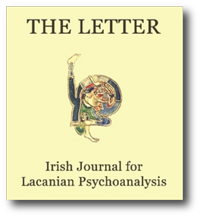 What social bond for the psychoanalytic discourse? which would give to each one his place in this group project. from S2) which do not have the help of any pre-established arrangement. the measure that the psychoanalytic discourse is forgotten. is a parlêtre that he is receptive to suggestion. be outside sense, a pure real? such as is forged in an analysis. Sharon-Zisser, at the conclusion of this most serious and impressive event. a number of weeks ago. these impressive lectures have created for such a respectable audience. This paper outlines an approach to Lacan’s XXVIth seminar Topology and Time. It begins with an examination of Lacan’s substitution of the philosopher’s being and time for the psychoanalyst’s topology and time by looking at Lacan’s deployment of the Moebius strip in clarifying the paradoxical temporality of the subject and the signifer. It then introduces the Borromean knot as a writing of the Real and attempts to explain the distinction Lacan makes between three different accesses to the Real: modelling, demonstration and monstration. Following a delineation of the place of the symptom and the unconscious in a nodal topology, this paper concludes by raising some questions about the temporality of the Borromean knot and outlining two of the concepts that Lacan introduced in Topology and Time – namely, ‘the generalised Borromean’ and ‘homotopic inversion’.